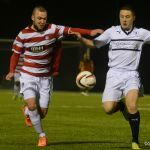 Raith Rovers slipped to defeat at New Douglas Park last night, after a last-second strike from Jason Scotland, handed Hamilton all three points. 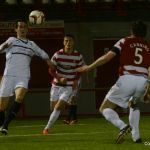 Grant Murray made a trio of changes from the weekend loss to Livingston. 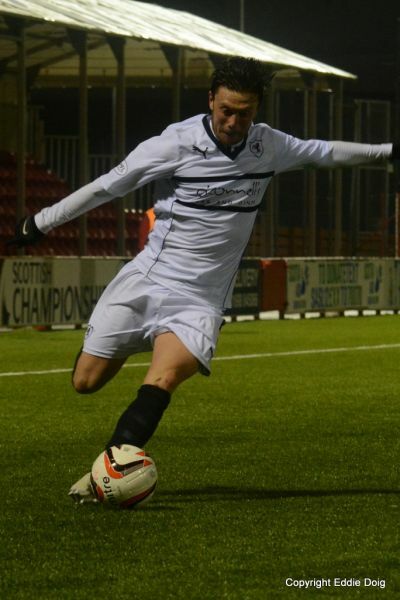 Paul Watson came back in at the heart of the defence for Reece Donaldson, while Fraser Mullen deputised in the middle-of-the-park alongside Liam Fox, for the unavailable Kevin Moon. 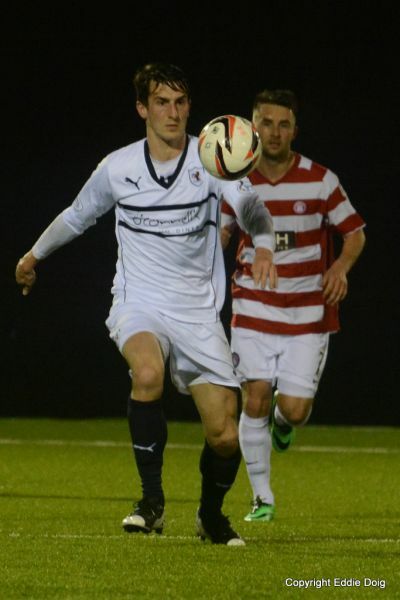 Lastly, Calum Elliot made his first start since the loss to Cowdenbeath at the start of February, partnering John Baird in attack. The opening period of the match was a tepid affair at best. Hamilton’s synthetic pitch looked an ideal playing surface from the stands, but any firmly hit pass seemed to gather speed as soon as it zipped off the fake turf. While the Raith players could be forgiven from taking some time to adjust, there were fewer excuses for Alex Neil’s men, whose long passes towards Keatings and Curier were all-too-often ending up in Robinson’s hands or being kicked straight out for a goal kick. 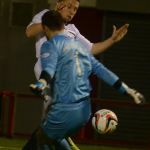 Hamilton’s slackness wasn’t Raith’s concern of course, and with two players returning from injury in Watson and Elliot, and Fraser Mullen in an unfamiliar central role, the home side’s tardiness in possession, allowed the visiting side, and those three men in particular, to get a feel for the match. Considering the importance to both sides of taking three points, the match seemed to be drifting along almost incident free. 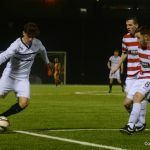 The viewing spectacle wasn’t helped by referee George Salmond’s predilection for awarding free-kicks in abundance, but the crux of the matter was that neither side were retaining the ball particularly well. 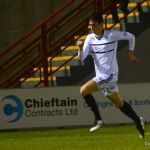 That said, Raith seemed organised, and with the onus more on the home side to attack, Raith seemed content to hit on the counter-attack, particularly through Grant Anderson, who seemed to be the focal point for Raith’s forays into the Hamilton half. It took until the 25th minute for the first meaningful chance to arrive, and when it did, it should have produced a goal. 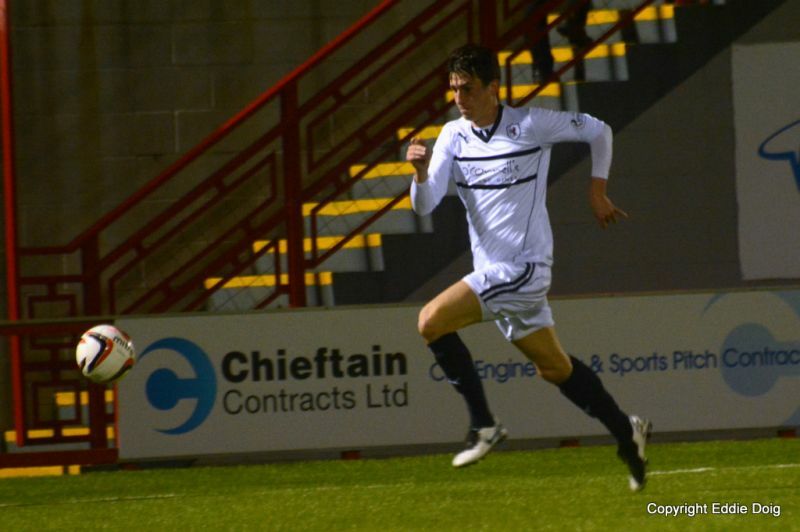 Ali Crawford got goal side of Callum Booth and sprinted into the area. With Antoine-Curier waiting on the edge of the six-yard-box, Crawford’s slide rule pass just evaded his outstretched leg, as the Guadeloupean waited to pounce. A little over five minutes later, the striker had an even better chance. Evading the off-side trap, Curier only had Robinson to beat, but after delaying his shot, possibly in attempt to trick Robinson into going to ground early, his dithering only succeeded in allowing the goalkeeper to narrow the angle, and block the attempt with his shins. Andreu then rippled the Raith net after being teed up by Darian MacKinnon, but his side-foot strike had gone the wrong side of the post. 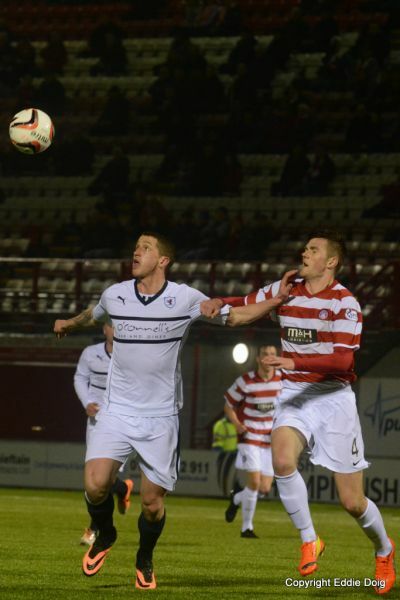 Five minutes before half-time, Raith almost snatched a barely deserved lead. 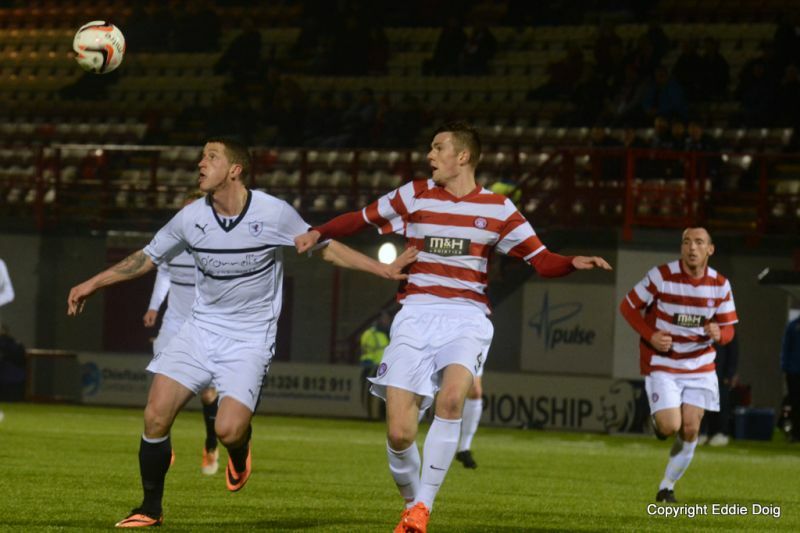 Cardle fed it to Baird, who scampered towards the Hamilton goal, albeit from an awkward angle. With Anderson in support, he didn’t appear to be asking for the ball, so Baird went alone, firing across Cuthbert and just wide of the far post. If that was a warning to the Hamilton rearguard, then it’s one they failed to heed, as Raith moved ahead in first-half injury time. 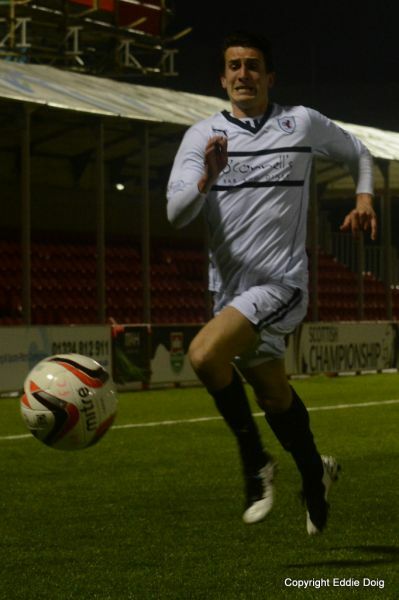 Robinson’s kick out was helped on by Elliot, which then somehow found Baird in yards of space inside the box, and his firm finish was planted past Cuthbert to put Raith a goal up at the interval. 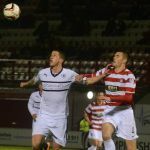 The beginning of the second period saw Hamilton up their work rate, pinning Raith back, although with no discernible chances created other than a Curier attempt that was blocked, after Hill and Watson backed off the striker a few yards too much. 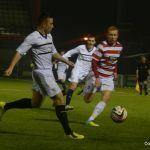 There seemed a palpable sense of Hamilton gaining the upper-hand however, as you would perhaps expect from a team that’s won five and drawn one of their last six matches. 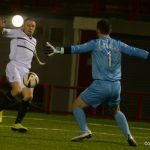 That feeling was further enhanced after Hamilton brought on Jason Scotland for Ali Crawford in the 61st minute, and within five minutes, the home side had restored parity. 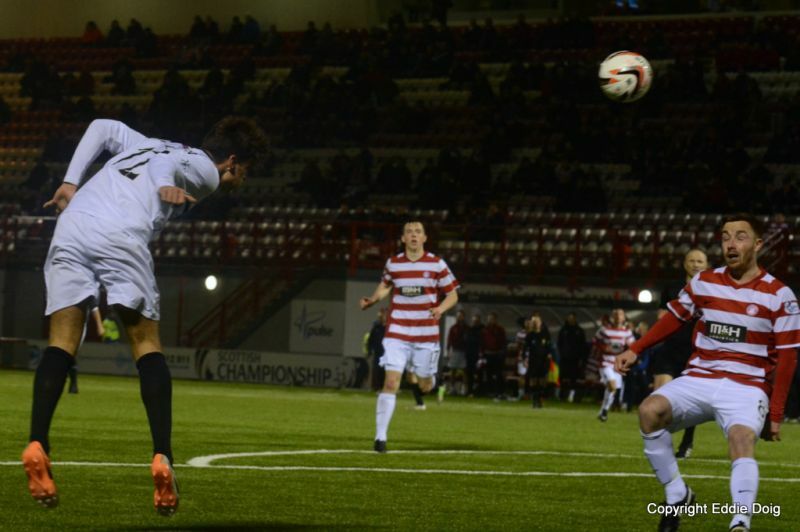 Frustratingly, the goal began with a Raith throw-in on the left-hand-side, near their own corner flag. 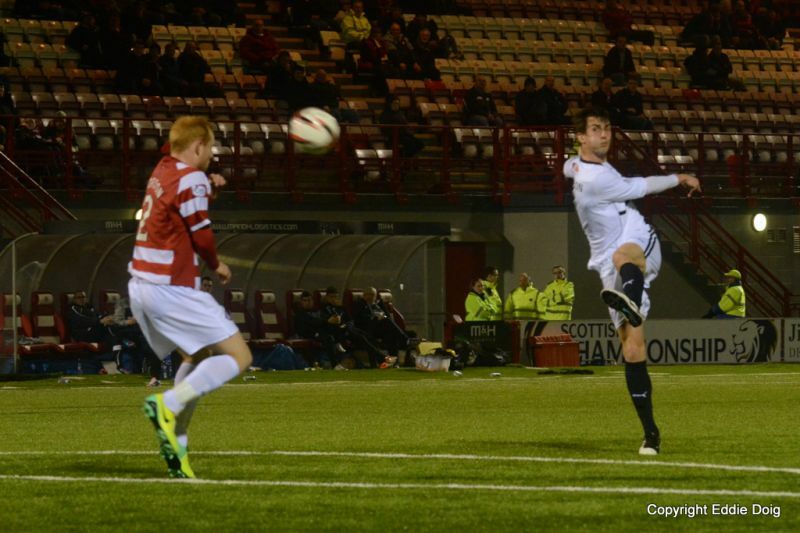 Booth’s throw was met by a Hamilton head, and was worked back into the middle of the park, just outside the Raith area, where it was met by Tony Andreu. His shot took a deflection off Watson, and nestled into the net via the inside of the post. 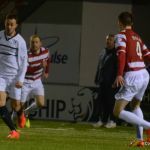 Worse was to come two minutes later, and again, Raith were the architects of their own downfall, with an almost carbon-copy goal. 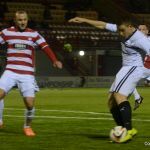 Again, Rovers had the ball in hand from virtually the same position as before, and once more, the throw-in ended up being squandered to Hamilton. 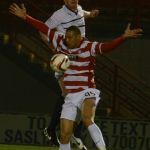 The cross from Raith’s left-hand-side found two Hamilton players at the back-post, one of whom was James Keatings, who nodded past Robinson from close range. 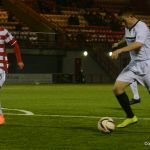 While Hamilton were the team who had enjoyed the bulk of the play up until this point, it was two dreadfully soft goals to lose, and Raith, as has so often been the case this season, had given themselves an uphill battle to get anything from the game. 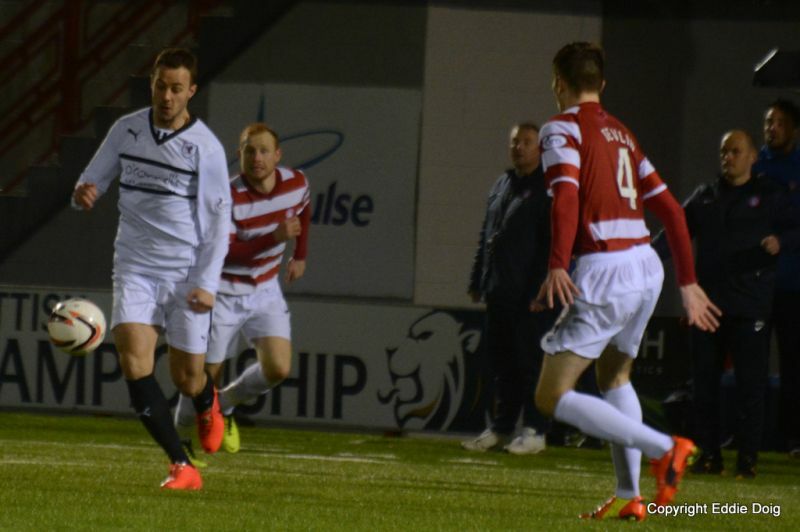 Raith heads weren’t down for long however, mere seconds in-fact, as they drew level within a minute of the restart. This time Elliot was the creator, flicking on to Baird, who nudged it past Cuthbert, and despite an awkward angle, lashed it into the unguarded net. With twenty minutes remaining, the game was now anyone’s, although you sensed that an open game would suit the home side more in the closing stages. Both sides eked out chances in the space of a minute. 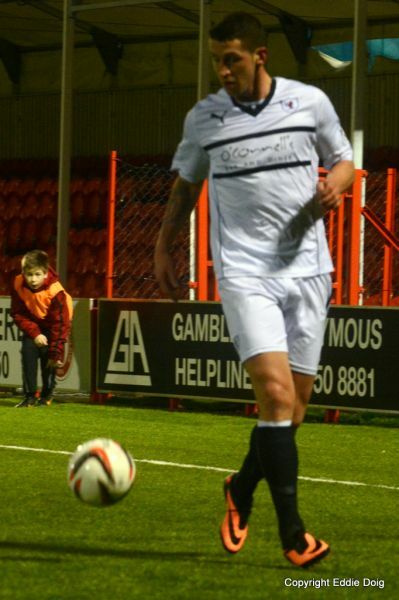 The first came for Hamilton, when a corner-kick was headed just wide, while Raith’s source was also a corner, with Dougie Hill heading Cardle’s cross wide. 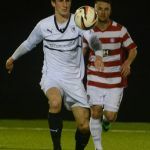 Raith were starting to enjoy a spell of possession, although lacked the creative nous to set up a chance. Indeed, with passes being over hit and going astray, it almost appeared that they still hadn’t quite mastered the extra pace the ball gathered on the surface. 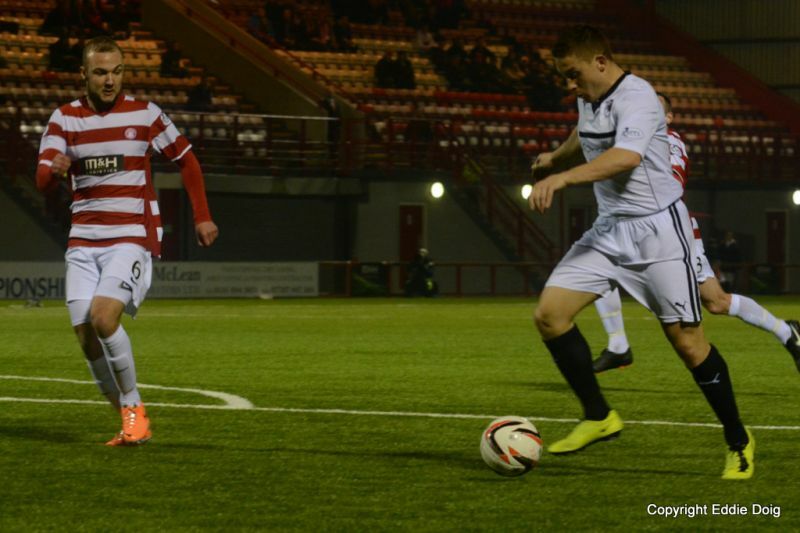 On 75 minutes, Grant Murray made his first change, swapping Ross Callachan for Grant Anderson. Callachan took up a central position, allowing Mullen to go wide right. 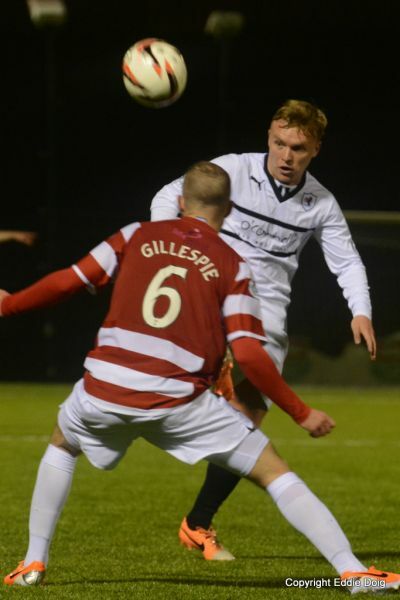 While Raith had struggled with throw-ins all evening, it was Hamilton’s Grant Gillespie who ended up taking the award for worst-shy-of-the-evening. Throwing it straight into the Lanarkshire night sky, he attempted to play on, by heading his own throw up the park, and comically hoping that no-one had witnessed the faux-pas. It was a brave try at covering up his poor throw, but predictably George Salmond spotted the infringement. 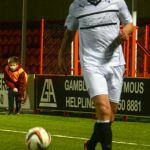 The latter stages of the match was starting to be played in Raith’s half, and the two sides looked very much like a team with confidence, versus a team who had little. 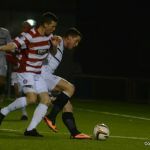 Hamilton looked the likelier to produce a late winner, and with time running out, Murray brought on Greig Spence and Gordon Smith, for Baird and Elliot, in an attempt to run at the tiring Hamilton defence, and push play back towards Cuthbert’s goal. At least that was the plan, but instead, although Spence attempted a few runs down the left during the last five minutes, the two front men ended up sucked in to a midfield that now looked extremely keen to hear the full-time whistle. 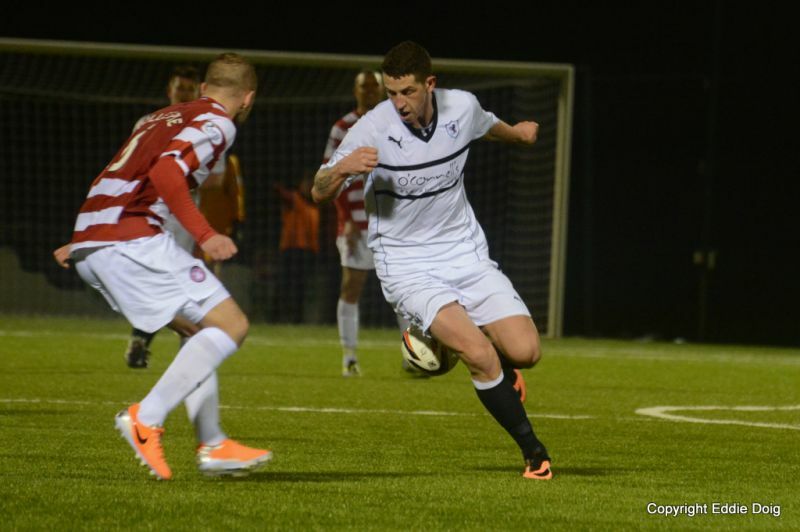 As the game entered the fourth minute of stoppage time, Raith had a breakaway, only for possession to be handed needlessly back to the home side. 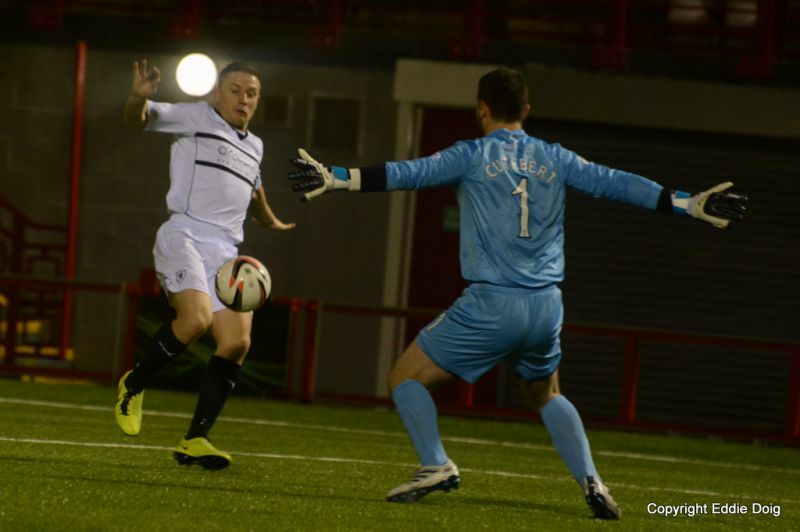 Callachan then appeared to deliberately commit a foul on the half-way-line in an attempt to stymie the play. From the free kick however, and despite chances to clear their lines, the ball ended up at the feet of Jason Scotland, who managed to turn and shoot from twenty yards. Just like the Hamilton’s first goal, it settled past Robinson after coming off the inside of the post. 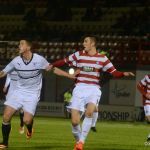 While Hamilton had the upper-hand during the game, it was an agonising way to lose a game of football, reflected in some Raith players who slumped to their knees as the ball swept past Robinson. It was a goal that seemed to sum up the malaise that currently blights the team. A miss-placed pass, a miss-timed tackle, a missed-opportunity to clear, mistakes which individually, don’t necessarily cost games, but when enough are made collectively, they end up contributing to a defeat. 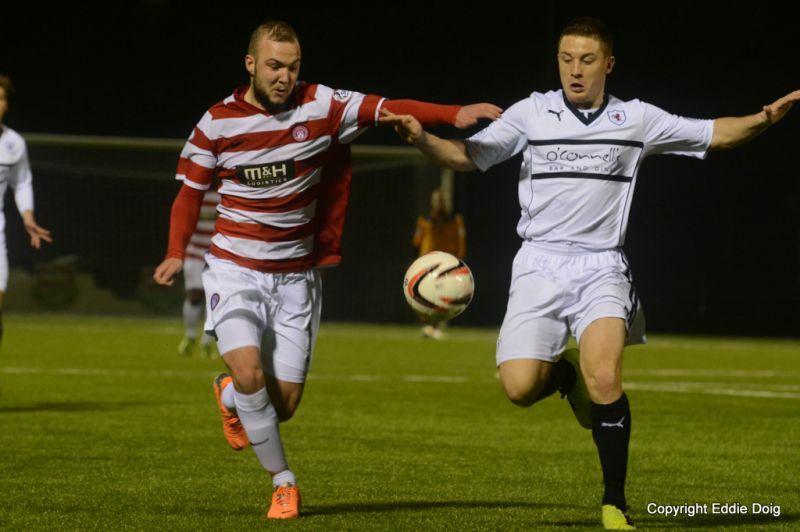 With just four points separating Rovers from ninth-placed Cowdenbeath, Raith must cling to what positives they can. The team, with John Baird in particular is scoring goals, and he linked up well with Calum Elliot, although the latter clearly tired towards the end. It’s slim-pickings, but with games running out, Saturday’s visit to Recreation Park, is looking more-and-more important. Welcome to New Douglas Park, the rain that followed us down the motorway has abated and conditions look ideal. Hamilton kick off towards the away support. Longridge the first to attack but he allows the ball to get away from himself. 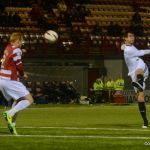 Baird in the box sees Devlin clear the threat. 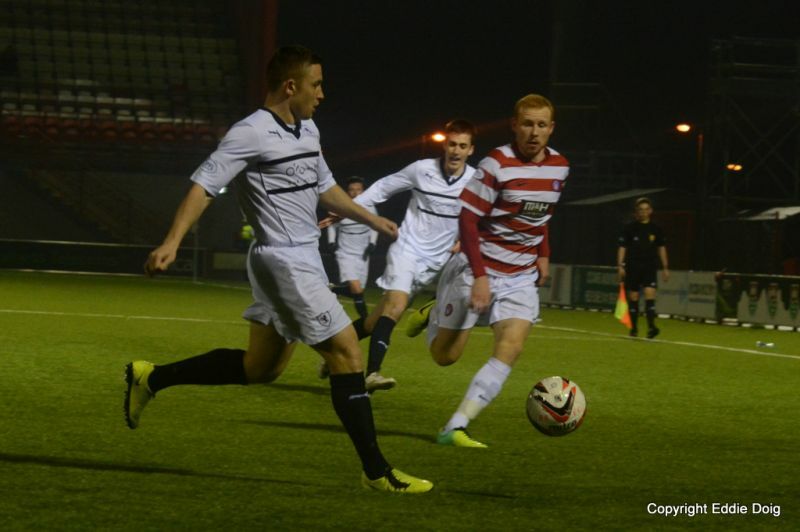 Elliot and Anderson combine on the right, Callum's pass was too strong and Accies clear. Crawford takes a free kick which was more likely to trouble the pie stall than Robinson. In terms of possession the opening ten minutes have been even. Gillespie tries from distance but the ball stuck Thomson in the back and Watson cleared. Both managers engaged in dialog with the linesman, the latter appears disinterested. The game needs something to spark it into life. 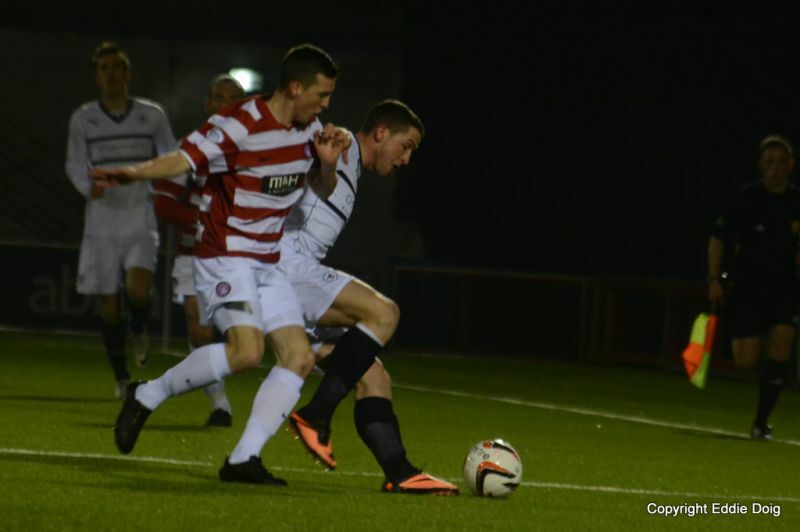 Mullen and Fox push through the middle, however play is stopped for an Accies injury. Crawford beats Booth to cross, the ball goes through a sea of legs and out for a throw. 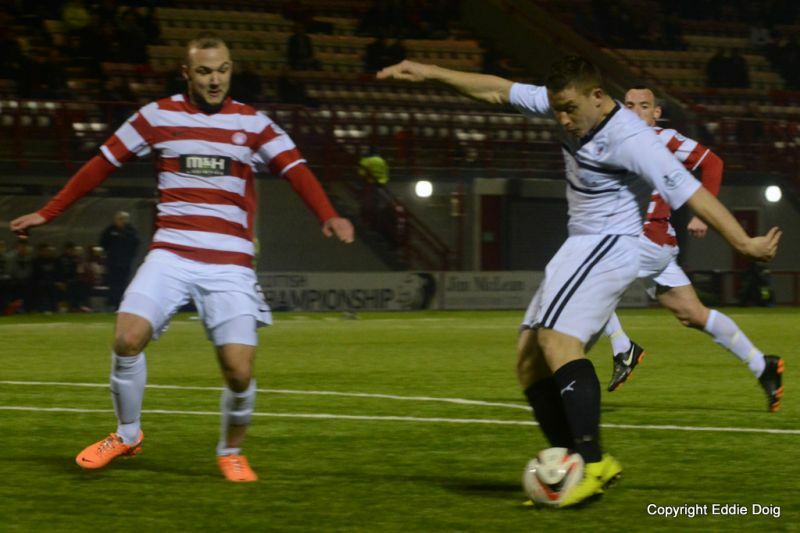 Keatings has a go from twenty yards but only managed to connect with the backside of a teammate. Although looking a bit groggy he is up and continues play. Fox yellow for foul play. Curier with three Rovers players in tow cracks the ball against the advancing Robinson. 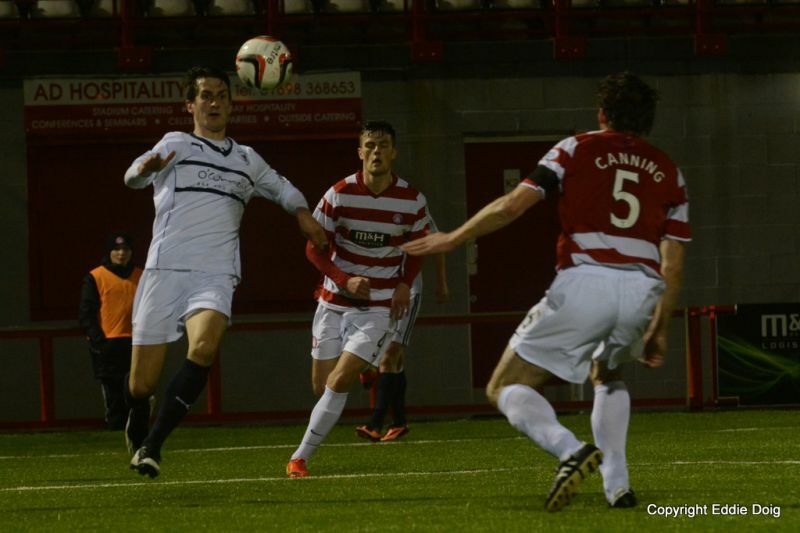 Baird is second to the ball in the Accies area. 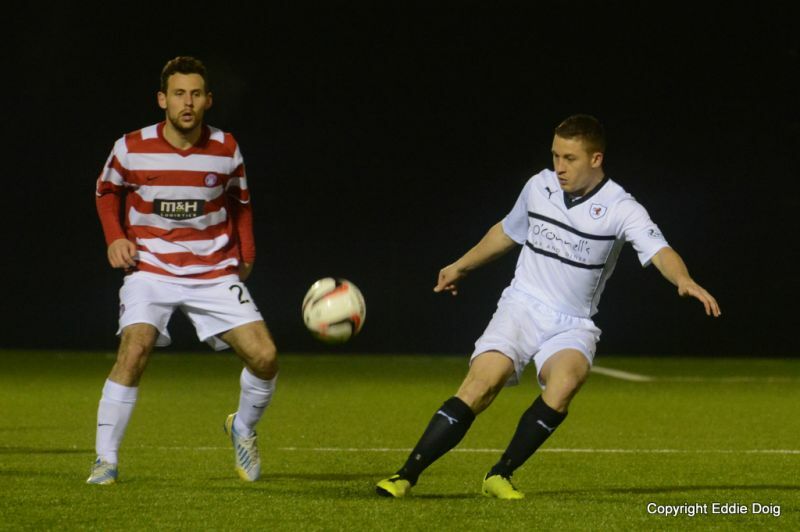 MacKinnon finds Andreu in the box but the pace denied him the opportunity of a decent shot and he fires wide. MacKinnon and Baird are told to kiss and make up after a minor spat. 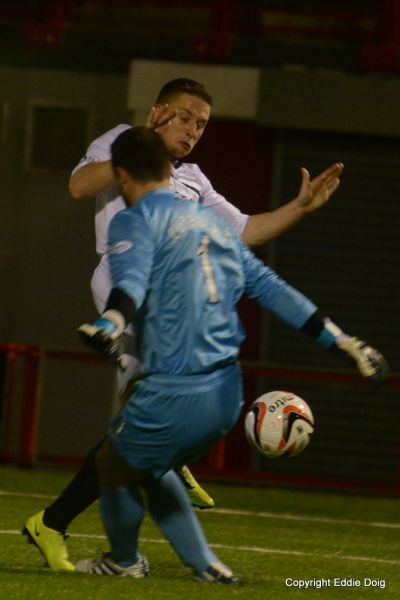 Cardle chips his defender and released Baird who spurned an opportunity by shooting just wide. Hill and Curier coming together gets the home crowd in a lather. GOAL ROVERS 0-1. Elliot and Baird break through, the latter hammered the ball past the diving Cuthbert. Elliot races down the right wing, early cross intended for Anderson cut out. Curier shot deflected by Watson for a corner. Hamilton corner narrowly headrd past the post. Corner Hamilton....goes long and its another corner. 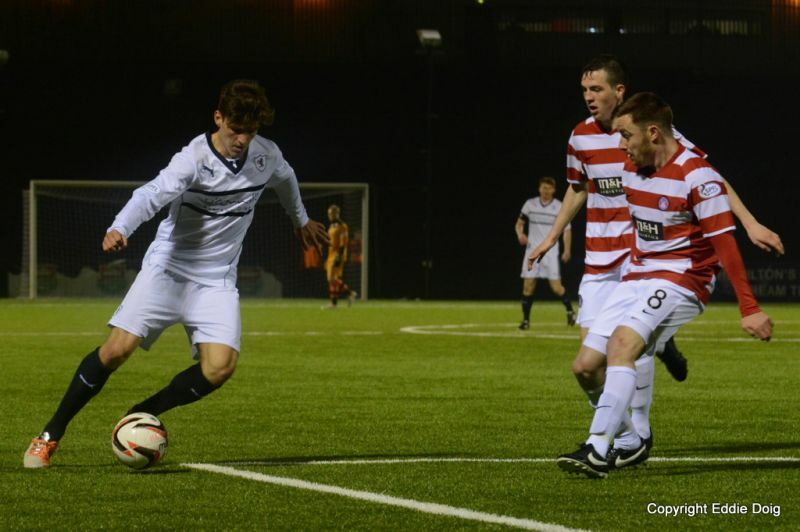 +2 callachan fouls deliberately ...good lad. ACCIES: 1 Cuthbert 2 Gordon 4 Devlin 5 Canning 6 Gillespie 7 Keatings 11 Crawford 17 Longridge 18 MacKinnon 22 Andreu 99 Antoine - Curier. ROVERS: 20 Robinson 2 Thomson 3 Booth 4 Watson 5 Hill 6 Fox 7 Cardle 10 Elliott 11 Anderson 19 Mullen 29 Baird.